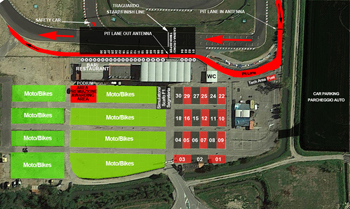 News 16/05/2016: Paddock Plan for the 24hr@Ottobiano on May 21/22. Any Team can park in the assigned space two caravans and a car or one caravan and two cars or four cars. All the other cars can be parked in the "Car Parking" Area. The REFUELLING is INCLUDED in the DRIVER CHANGE TIME, which is of TWO MINUTES instead of ONE MINUTE AND 30 SECONDS. At any pit lane entry the Teams can decide for a complete or partial refueling. News, 02.05.2016: L'ITalian Kart Challenge 2016 will be raced with one class only, the GT1. GT2 class has been canceled due to the higher number of teams in comparison with the GT2 Class. The GT2 teams left passed in GT1 class. The 24hr on May 21/22 wil be raced with the track lighting without the led lights on the karts. Season 2015 just ended... It's time to go full speed ahead for 2016. 2015 has been a year full of improvements, so in 2016 everything will be even more developed. The karts for Season 2016 will be a Racing "KF" chassis powered by Briggs & Stratton Series 2100 420cc engine has been appreciated by anyone. Racing with LED lights in the night gave emotions to all the drivers. For this reasons all these will be mantained and upgraded. In the Season 2016 will have all the karts powered by Briggs&Stratton series 2100 420cc in a "Tuned" version with 20hp. The Season will be upgraded too... All new racetracks, and one more race: the "Double Eight", with two 8hr Manches, each one with its Practice and Qualify sessions. The first 8hr will be CLOCKWISE while the second 8hr will be COUNTERCLOCKWISE . Another news: the option to register the Team and buy the kart. The rental cost will be counted in the fee and the kart is owned by the Team and managed by the Organization in all the races of the ITKC 2016 only. We have made a Partnership with our Friends of the GTC (German Team Chapionship) in Germany to let the German Teams come here in Italy to race. Another Partnership has been made with our Friends of the Portoguese SKClube, that have the same engine, the same clutch of the ITKC on a racing chassis, to let them race with their karts in the ITKC 2016. I really hope to shake your hands on the Starting Grid in 2016 and wish you all the fun and challenge, and a fair competition in the racetrack.